We're going to duck the pad using the kick sidechained into a compressor. Sidechaining is an integral part of many of today's sounds, and few pieces of dynamics software dare to leave it out. You can make your own take on the sidechain concept using some clever signal routing. Perhaps you want to apply a distortion effect to a track only when another track is pushing against it in a mix, duck the master buss with your favourite classic compressor, or gate a part when one, two or multiple other parts are playing? By deconstructing what the sidechain function does, we can make a workaround that'll push our trigger audio into a space that's separate from the other audio, so it can be removed after the process has been applied. Here, we're going to pitchshift a kick signal to lower it as far as it can go in frequency, but a signal could also be raised in pitch, too, if you've got the capability to do so. Designing your sounds so they won't clash at this stage is a helpful way to get it done. For more DAW effects hacks, check out the feature in Future Music issue 281. Step 1: Here are a kick and a pad. We want to duck the pad using the kick sidechained into a compressor. But we'll go the long way around. This is a solution for dynamics processors (compressors, gates etc) without sidechain inputs, though - in modern software at least - these are fairly rare. Step 2: Create a new Return channel - ours is named Kick Shift - and send the Kick channel to it. Ensure the send is made pre-fade, as we'll want to mute the original Kick channel to show the setup's working. Now we'll pitchshift the kick down as low as we can. Step 3: The idea is to create a separation in frequencies between the kick and the pad - we've had to use steep low-pass filtering between pitchshifts, and the analyser shows we've contained most of the kick under 100Hz. Step 4: The pad's lowest frequencies are above 100Hz, so we've made the separation. Send both the Kick Shift and original Pad channels to a new Combiner return channel (pre-fade again) and turn down everything but this new channel in the mixer. Step 5: An analyser will show how well-separated the two parts are. Use Kick Shift's send amount to bring the two parts to the same level, then strap a compressor over the Combiner channel, dialling in those pumping/ ducking sidechain sounds. 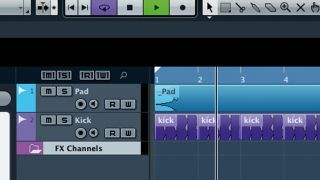 Step 6: For the coup de grace, a high-pass filter rips the kick out of the track, leaving only the pad, which is still bouncing around from the compression we just dialled in. To pipe the original kick back in, use the Kick channel's fader.